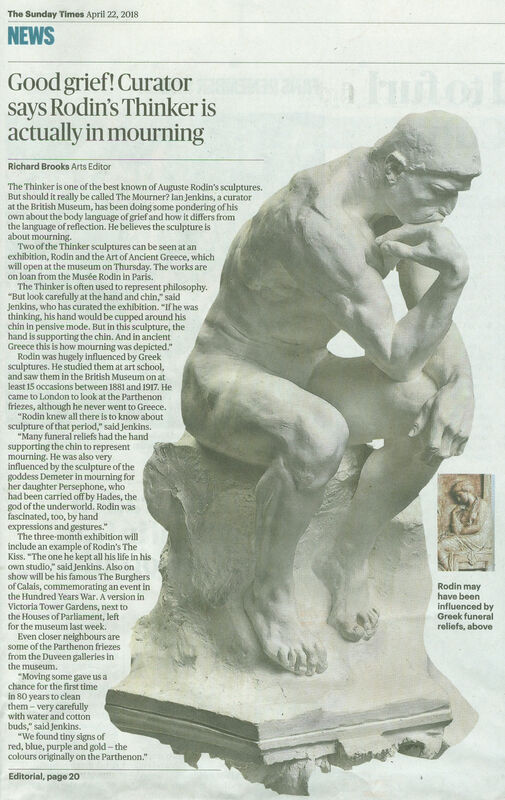 Last night we were bidden, as Sir Roy Strong might have put it, to the opening and reception of the joint British Museum and Rodin Museum exhibition “Rodin and the art of Greece”. It proved an extraordinary and privileging occasion that was close to our heart in very many respects. 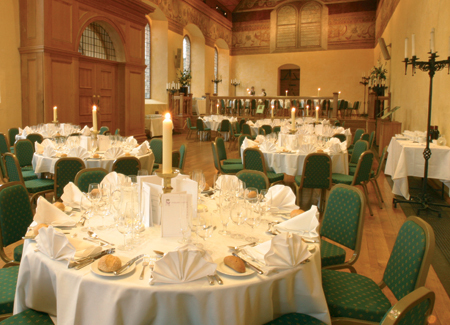 Guests were ushered into a corner of the Great Court for drinks and canapés. In that dwarfing space the buzz of expectation among the small standing groups resembled a Royal Opera House opening of Verdi’s Un ballo in maschera. The company was illustrious. Among the many VIPs, journalistic aristocracy was present in Sir Simon Jenkins of the Guardian and Lord Gnome of Private Eye. 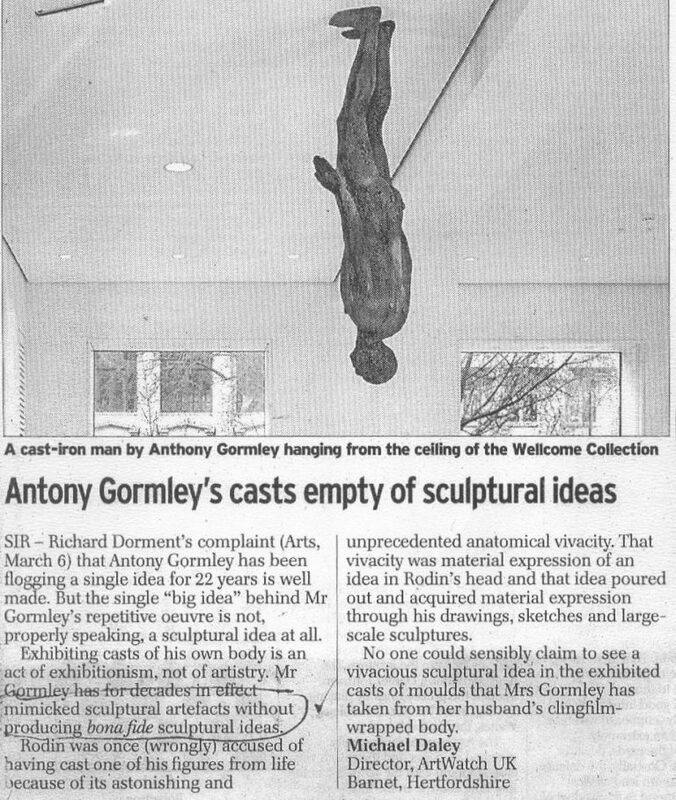 The Two Greatest Living British Sculptors were represented by Sir Anthony Gormley R. A. (who sported some Palestinian headwear around his neck). The British Museum’s new director, Hartwig Fischer, opened the speeches well and graciously. The man from the generous sponsors, Bank of America, Merrill Lynch, followed and the French Ambassador opened the exhibition itself with certain ironical asides about the virtues of European cooperation. And we then poured into the exhibition. As others have already indicated, this show, the combined product of a great dedicated artists’ museum and a great “universal” encyclopaedic museum, is simply stupendous. On entry, the shock of the space and its fabulous contents was also operatic: a beautifully lit elegantly constructed chip-board “set” snakes down the centre of the otherwise soul-less and dispiriting Lord Rogers’ black box, which, thankfully on this occasion, has been opened to disclose a courtyard. The continuous low plinth carries the larger, show-stopping sculptures and creates subsidiary spaces that house drawings and smaller works. Sparks fly between the works on display. The labels are good and the catalogue is exemplary. If the essential message of this engagement of a giant of modernism (Rodin) with a legendary classical artist (Phidias) – that to advance we must look back – seems subversively reactionary in today’s art world, so much the worse for us. But for this artist, the timing feels optimal: Modernism is a spent and disintegrating force. Its void is filling with assorted non-artistic activisms and relativisms. The show is welcome in other respects. It springs from the strengths of museum curators working to their departmental briefs, in this case that of Ian Jenkins, a very fine classical scholar, who himself, as it happens, has carved stone. Even before the show opened Jenkins was creating sparks of his own. 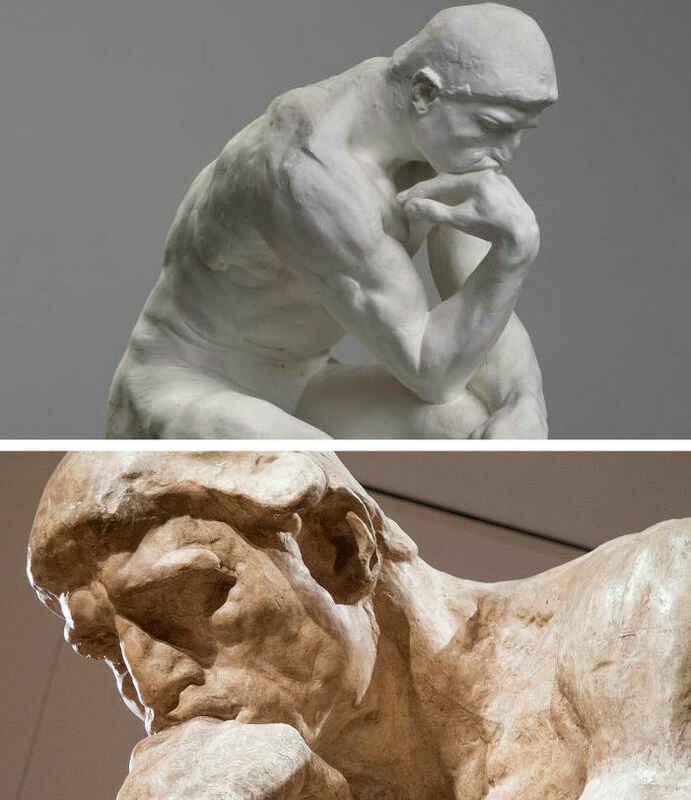 He had noticed a distinct echo in Rodin’s “Thinker” of a convention for mourning figures in Greek classical art. 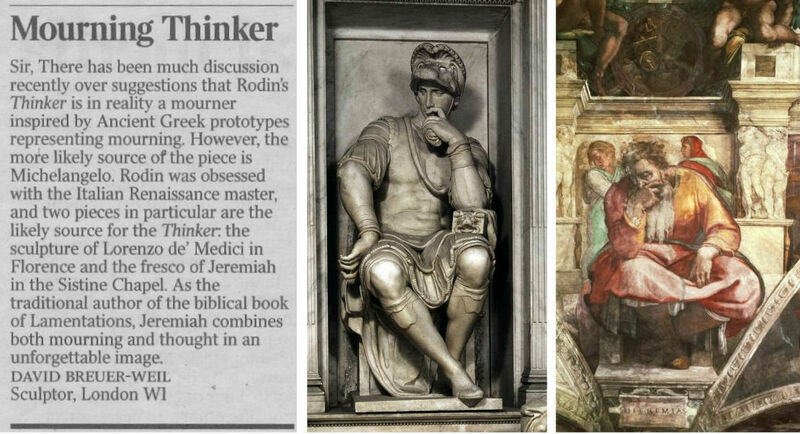 Yesterday (24 April), a sculptor took issue with this suggestion in a letter to the Times (see below) claiming a likelier source to be present in Michelangelo’s sculpture and paintings. 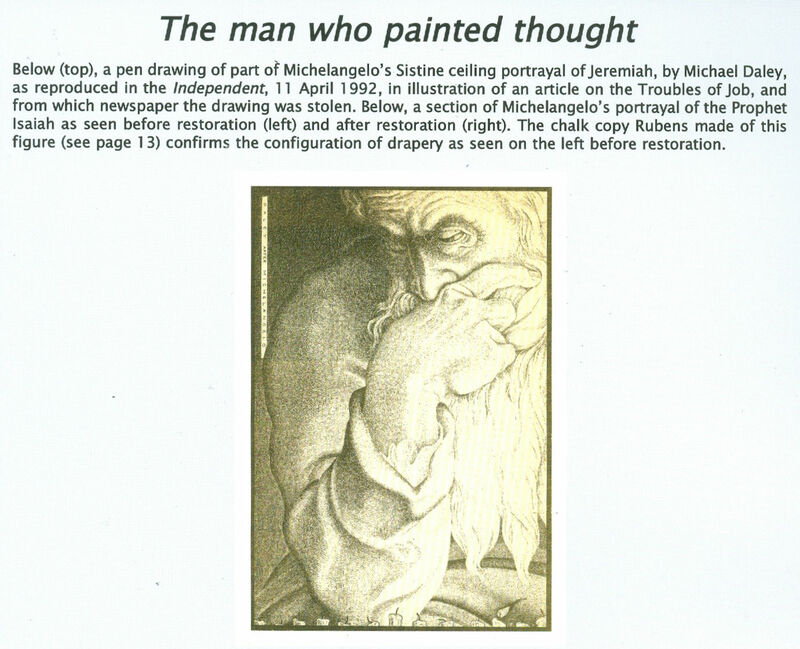 As seen in the Jeremiah detail we had adapted for a newspaper illustration (above), the head rests heavily on the hand which grips the lower face and entirely conceals the mouth – perhaps this near-universal indicator of thought stems from the source of speech being taken out of commission? There is a vital difference between the Thinker and the Jeremiah. In the former, the head rests heavily on the hand but the forearm/hand serves only as a prop or buttress. Indeed, the entire figure is a dynamic portrayal of weight, as we noted in graphic shorthand last night in the diagram below right. Even the legs are involved in buttressing the entire slumping figure who grips the very earth with his toes (photo. by promentary.net.au). Crucially, the hand does not engage directly or expressively with the face other than insofar as the upward buttressing force of the knuckles distorts the upper lip. 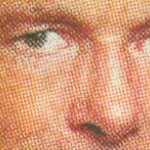 The face itself (above) is not simply thoughtful or absorbed but mournful, desolate. This head is as heavy as the heart within the figure. Jenkins seems vindicated on his observation. For artists and, particularly for sculptors, this show is, more than an invitation, a command to stop, look and draw. The British Museum has sensed as much and will be making drawing materials available to visitors. For our part, we would urge them not to be bashful and to seize the opportunity to draw unselfconsciously and purposively. Drawings are best seen not as a species of self-expression but as straightforward explanations. Draw to explain that which seems interesting significant or distinctive in a particular figure. There are no right answers here, just nice observations worthy of being made. Drawing regularly disciplines thinking and sharpens looking. (Degas once told a woman she had a beautifully drawn head. Draughtsmen know exactly what he meant.) 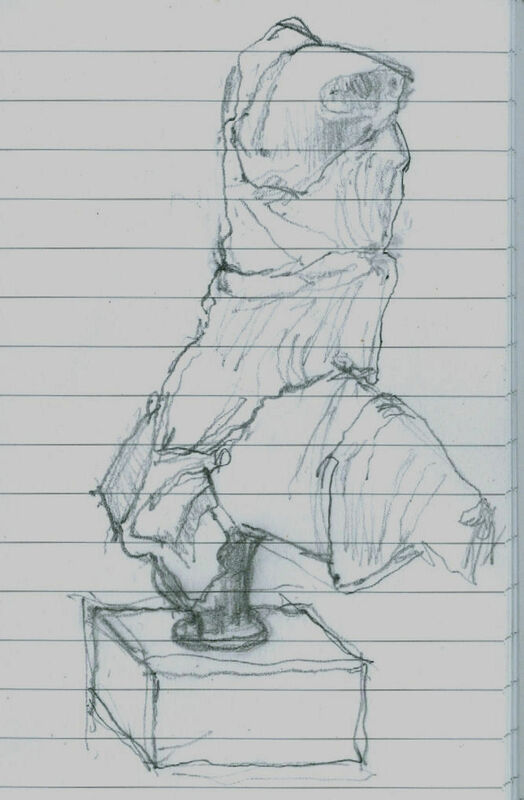 Last night we snatched some drawings of the backs of figures, as below with Iris from the Parthenon whose flowing animalistic energy directly inspired Rodin to make an even more dynamically eroticised bronze. We would especially urge all visitors to take careful note of a little showcase at the far end of the gallery (next to a demonstration of plaster piece/mould casting). In it are two small modelled figures that constitute a summation of Rodin’s sculptural insights. 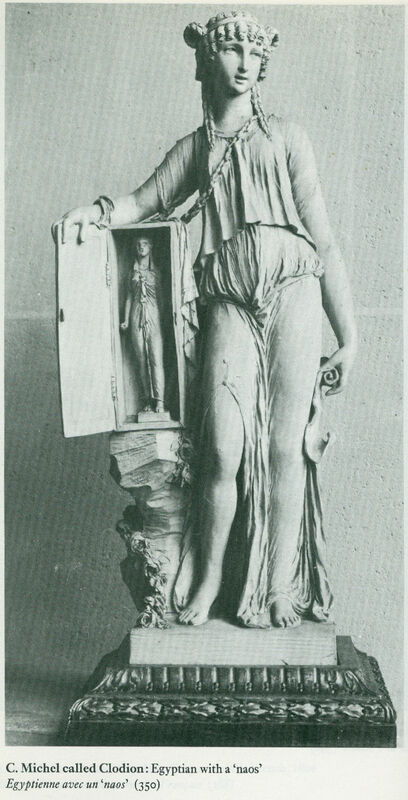 The models were made to explain/demonstrate the differences between classical sculpture and Michelangelo’s figures. 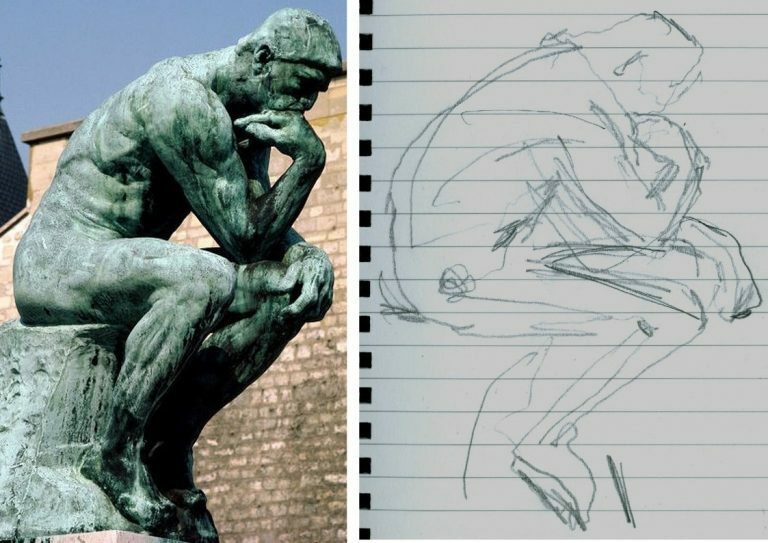 We wrote of Rodin’s understanding of differing figural conventions four years ago in the Jackdaw magazine. “The clay figure was taking shape. Rodin’s hands came and went, adding bits of clay; gathering it with in his large palms, with swift accurate movements; then the thumb and the fingers took part, turning a leg with a single pressure, rounding a hip, sloping a shoulder, turning the head, and all with incredible swiftness, almost as if he were performing a conjuring trick. Occasionally the master stopped a moment to consider his work, reflected, decided, and then rapidly executed his idea…Rodin’s statuette grew into life. It was full of rhythm, one hand on the hip, the other arm falling gracefully at her side and the head bent. ‘I am not [f]atuous enough believe that this quick sketch is as beautiful as an antique,’ the master said, laughing, ‘but don’t you find it gives you a dim idea of it? […]Well, then, let us examine and see from what this resemblance arises. My statuette offers, from head to feet, four planes which are alternatively opposed. The plane of the shoulders and chest leads to the left shoulder – the plane of the lower half of the body leads towards the right side – the plane of the knees leads again towards the left knee, for the knee of the right leg, which is bent, comes ahead of the other – and finally, the foot of this same right leg is back of the left foot. So, I repeat, you can note four directions in my figure which produce a very gentle undulation through the whole body. ‘This impression of tranquil charm is equally given by the balance of the figure. A plumb-line through the middle of the neck would fall on the inner ankle bone of the left foot, which bears all the weight of the body. The other leg, on the contrary, is free – only its toes touch the ground and so furnish a supplementary support; it could be lifted without disturbing the equilibrium. The pose is full of abandon and of grace. 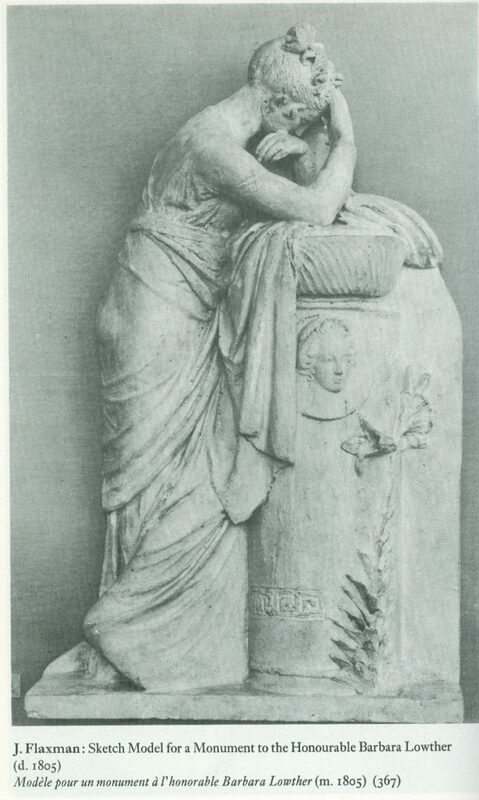 ‘His figures surely seem to be carved to meet this test; but it is certain not a single antique could have stood it; the greatest works of Phidias, of Praxiteles, of Polycletes, of Scopas and of Lysippus would have reached the foot of the hill in pieces. And this proves how a formula which may be profoundly true for one artistic school may be false for another. This Rodin/Phidias show has not been cost-free in terms of disruption and the further cleaning of the Parthenon sculptures but, leaving such aside, it is the most sculpturally engaging and instructive we have seen since the great 1972 Royal Academy and Victoria and Albert Museum exhibition “The Age of Neo-Classicism”. 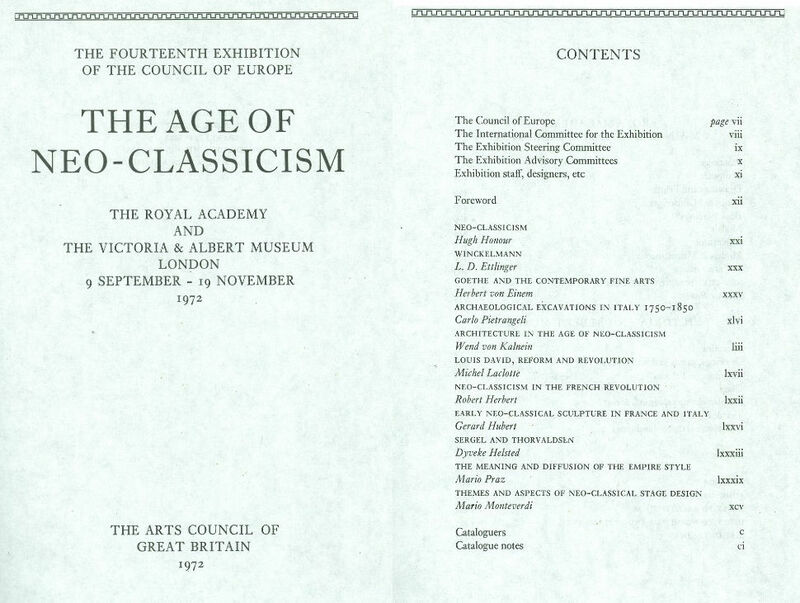 ArtWatch has no politics and, as mentioned, this is an entirely personal response to an exhibition but, nonetheless, we would respectfully point out to the French Ambassador that that earlier wonderful internationally cooperative Neo-classicism show – the fourteenth exhibition of the Council of Europe – was mounted two years before Britain voted to join what was presented to its electorate as a common market in goods. Culturally-speaking we were all Europeans then and we will remain so after Britain has exited the grand project (some believe great folly) that is the European Union. 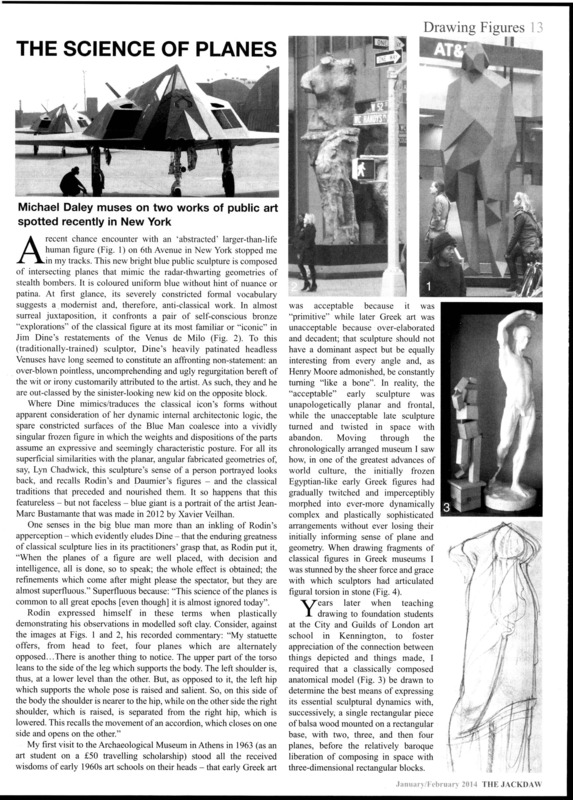 In or out of that organisation, Britain and France will continue to play roles in pan-European culture, just as did the two sculptors below, one being French, one British, whose work was included in the 1972 exhibition. The Briton, Flaxman, had earlier echoed the ancient convention of mourning that Ian Jenkins has so well spotted in Rodin. Art is a universal and welcoming, all-inclusive language. We should keep politics out of it at all costs. Simon Jenkins’ apologia for heritage industry “Disneyfication” (- as discussed in our last post) was echoed by Simon Thurley, the Chief Executive of English Heritage, in last weekend’s Financial Times (“Disneyland with footnotes or ancient skills revived”). Thurley claimed that at Stirling Castle, Historic Scotland has “recreated Queen Mary’s Lodgings with a fearsome degree of authenticity”, even though it had almost no surviving interior material to go on, other than “a few chimney pieces and a couple of doors”. Such an oxymoronic combining of the terms “re-creation” and “authenticity” merits examination. Current attempts to remake history are occuring in a distinctly complacent and insufficiently examined cultural/bureaucratic context. The peg for Thurley’s article was the payment by Historic Scotland of one of those nicely rounded restoration bills (£25m) queried by the Daily Telegraph blogger, Andrew Brown in response to a public appeal for a neat half a million pounds to “conserve” Roald Dahl’s writing hut by moving its contents to the nearby Roald Dahl museum as a “major new interactive exhibit” for school groups and “thousands of visitors a year”. The Royal Palace at Stirling Castle was built in the late 1530s for King James V and his wife Mary of Guise but it had been used as a barracks for nearly 300 years. £12m was spent “putting the interiors of the palace to rights” (Fig. 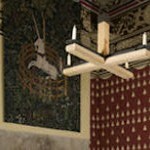 1) and £2m alone was spent copying the (authentic) Unicorn Tapestries in the Cloisters Museum, New York (Fig. 2). 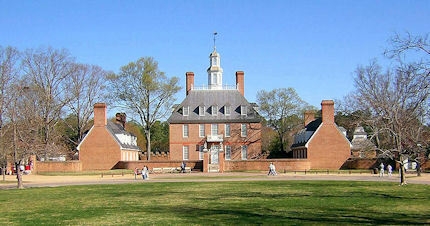 Thurley cites as an antecedent for this kind of hypothetical “recreation”, the Governor’s House in Williamsburg, Virginia, which having been burned to the ground in 1781 was rebuilt as new in the 1930s (Figs. 3 & 4). Although Thurley sniffs “This was not restoration; it was a recreation” he seems untroubled that the original authentic contents of the Stirling Castle interiors had been lost before the Governor’s House was first built. While noting that although the Williamsburg rebuilding was judged by some American academics and most European curators to be “Disneyland with footnotes” when just such recreations were later made on this continent in the wake of the devastation of the Second World War, Thurley misses the fact that frankly declared attempts to recreate historically and architecturally important buildings on the basis of surviving visual and documentary evidence are of a different order from Britain’s heavily bureaucratised drive to convert old buildings, by means of speculative, “interactive“, historical enactments and vulgar websites that dangle Reality TV style soap operas as history, into tourism moneypots. English Heritage explicitly states that the conservation movement has evolved from a “reactive process” that prevents change into a “flexible process” that recognizes the best way to save a building is “to find a new use for it.” It further admits that to achieve this more “constructive” end, “we work collaboratively with architects and developers at early pre-application stages”. Such collaborations spawn increasingly patronising and crass marketing campaigns. At Stirling, a truck decorated with the castle’s Unicorn emblem constitutes “The Stirling Castle Road Show” which tours Glasgow, Edinburgh and Dundee offering city centre shoppers the chance to discover what is on offer at the castle for “a great day out”. Marketing Executive Nicola McCrae masterminds this “new way to promote the castle and visitor experience”. The visitor experience includes a deceiving invitation to: “step into the astonishing richness of royal life in the 1500s” by presenting James the Fifth’s palace as “one of the finest and best-preserved Renaissance buildings in Great Britain”. The claimed “crowning achievement” of this supposedly best-preserved palace is the banqueting hall (Figs. 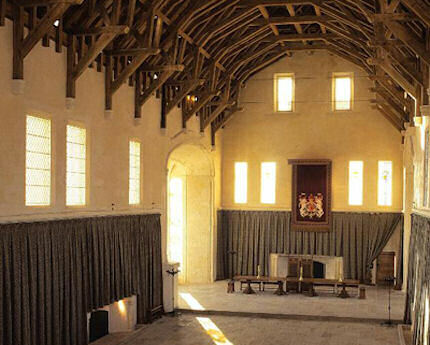 5 & 6) where the original roof, which was removed in the late 1700s, has been replaced with a replica of an original roof that survives at Edinburgh Castle’s Great Hall. Replications and hypothetical reconstructions now abound at the castle. In the King’s Inner Hall the ceiling-mounted brightly coloured roundels known as the Stirling Heads are facsimilies made from surviving original heads after their “painstaking conservation” (Fig. 7). On the basis of surviving scraps of colour on the carved wooden originals (which, mercifully, are exhibited in a separate gallery within the castle), the facsimilies have been speculatively painted in the “bright colours” that were “almost certainly” used originally. 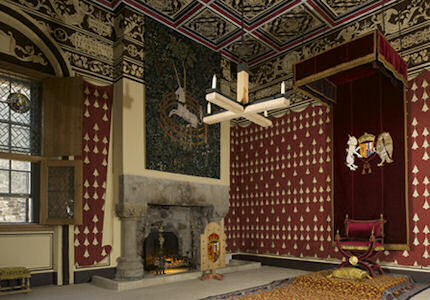 Colour looms large throughout these reconstructed interiors on the belief that they “would have been overwhelmingly colourful, rich and elaborate [because] James and his French wife Mary of Guise aimed to present themselves as wealthy, learned and sophisticated.” The visitor will learn that “royalty ate well and entertained lavishly” but less of what their learning and their beliefs consisted. 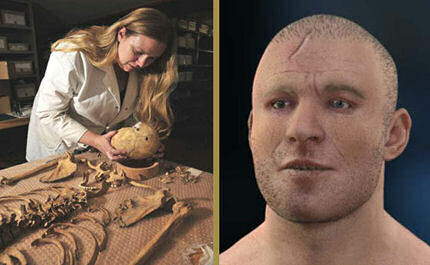 Speculative reconstructions reach their apotheosis with old bones (Fig. 8). 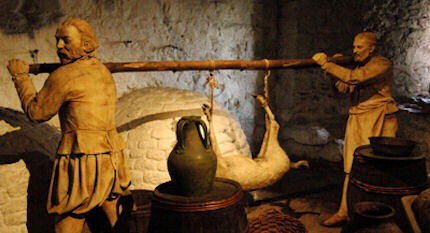 In the Great Kitchen, visitors are invited to “Rub shoulders with the busy kitchen staff preparing food and drink for a royal banquet” – the said staff members being the ubiquitous heritage industry tableau dummies (Fig. 9): “This bustling scene has been re-created for visitors, with a soundtrack to help create the atmosphere.” A soundtrack from the 16th century? For such deceptive absurdities, visitors are charged £13 a head (£10 for “concessions”, £6.50 for children). With a staff of 4,300 and comprising Europe’s largest conservation charity, the National Trust similarly hopes to achieve its seeming goal of preserving and protecting everything that doesn’t move by “encouraging millions of people to visit and enjoy their national heritage”. Keeping children – even small unruly ones – happy is seen as the key to maximising Heritage Income. 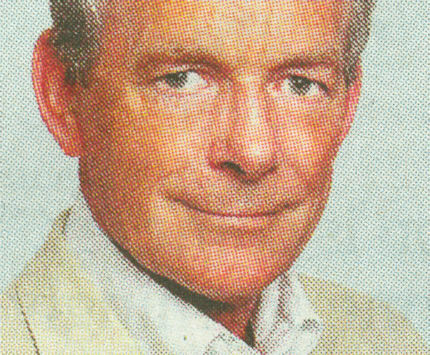 The National Trust’s chairman, Simon Jenkins, concedes that although you cannot have blazing sun on a medieval tapestry, or children bouncing on an ancient bed, “it is jolly nice to have a bed they can bounce on somewhere.” To the charge of “Disneyfication” he responds “If it means making our properties more popular, then I am totally unrepentant.” There are other ways of presenting history. For those repelled by crassly commercial exploitations, we would commend the delightfully kept, privately-owned, magically tranquil ruins of Jervaulx Abbey in North Yorkshire. Above, Fig. 1: One of the main rooms at James V’s Palace at Stirling which is said to be “much as it may have looked on completion around 1545″. Above, Fig. 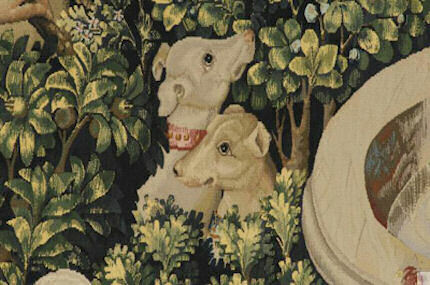 2: A detail of one of the copies of the Unicorn tapestries in the Cloisters Museum, New York. Above, Fig. 3: The front of the Governor’s House in Williamsburg, Virginia. Above, Fig. 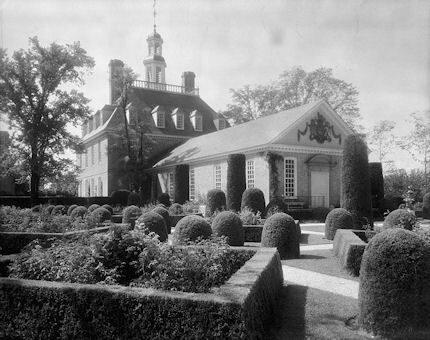 4: The back of the Governor’s House in Williamsburg, as photographed around 1935 by Frances Benjamin Johnston, one of America’s earliest female photographers. Above and below, Figs. 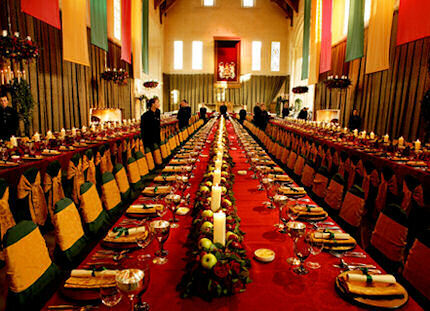 5 & 6: The Banqueting Hall, Stirling Castle, which can be hired for corporate seminars, formal banquets or ceremonies. Above, Fig. 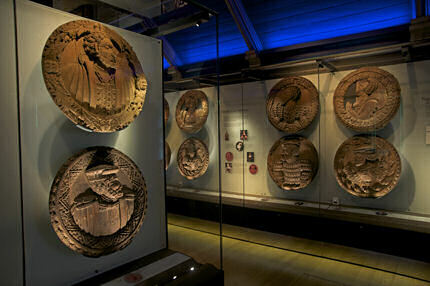 7: Some of the surviving original Stirling Heads, as exhibited in the castle museum. Above, Fig. 9: One of the Great Kitchen scenes, as re-created for visitors, with an accompanying soundtrack. Sir Simon Jenkins says a Tate Gallery restorer’s repainting of one third of John Martin’s flood-damaged “The Destruction of Pompeii and Herculaneum” (from a Photoshop composite of an old photograph and another version of Martin’s painting) is brilliant. He says that the ruins of Pompeii itself, having been largely destroyed when bombed by the RAF “as part of its casual assault on European civilisation” should now be reconstructed according to our idea of how they might have been originally. He says that we should no longer fret about making mistakes when reconstructing the past because “seeking to re-interpet, even reconstruct, some works of the past no longer need attract jeers of ‘Disneyfication’, and that too is preferable to terminal decay.” Given that Sir Simon is chairman of the National Trust, these sentiments are alarming as well as wrong-headed: the past, or what remains of it, is not ours to remake on modern prejudices and fancies – and with an eye on the tourist trade. There have been signs enough that the commercial exploitation of history and its surviving artefacts is gaining the upperhand over an appropriate respect for the integrity and authenticity of what has survived – not to mention evidence of a declining recognition of our own cultural limitations in these matters. Above: Sir Simon Jenkins in the Guardian.